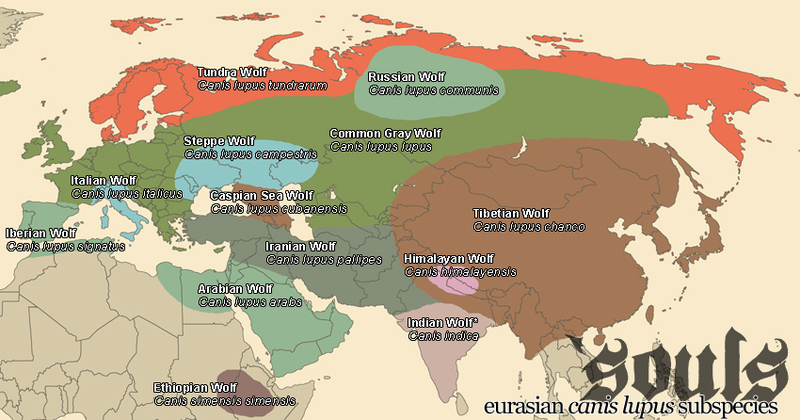 Eurasian Subspecies Map. See also: world species map. Found at altitudes above 3,000 metres (9,800 ft) in the Afro-alpine regions of Ethiopia. The Ethiopian Wolf is a medium sized canid resembling the coyote in size and conformation, having long legs and a narrow pointed muzzle. It weighs 24 – 42 pounds (11 - 19 kg), exhibiting the typical sexual dimorphism found in Canis species. The teeth are small and widely spaced, an adaptation to their rodent-heavy diet. The Ethiopian Wolf's canine teeth are sharply pointed and average three-quarters of an inch (19 mm) in length. The ears are pointed and broad, sporting thick inner fringes. The front feet have five toes, while the back have four. The coat is ochre to rusty red on the face, ears and upper portions of the body and white to pale ginger on the underparts. Small white spots are present on the cheeks, as well as a white ascending crescent below the eyes. The contrast of red and white markings increases with age and social rank. Females tend to have paler coats. The back of the tail has a short, rufous-coloured stripe which ends in a thick brush of black guard hairs on the tip. The pelt has short guard hairs and thick underfur which protect the wolf from temperatures as low as -15 °C (+5 °F). Initial molecular evidence suggested that the Ethiopian wolf was a descendant of the Grey Wolf; however, more recent evidence suggests that this is not the case. Although the Ethiopian wolf is closely related to other wolves, it probably diverged some three or four million years ago. There are just two subspecies of the Ethiopian wolf, differentiated by their nasal bones and coat sizes. The simensis subspecies, which occurs northwest of the Great Rift Valley and can be distinguished by its shorter nasal bones and less red coat. 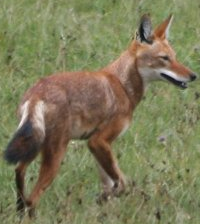 The citernii subspecies, which occurs southeast of the Great Rift Valley and can be distinguished by its longer nasal bones and redder coat. 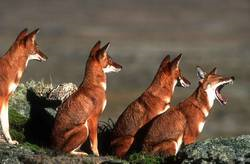 Ethiopian wolves typically roam in large packs, generally consisting of 6 adults, 1–6 yearlings, and 1–13 pups. 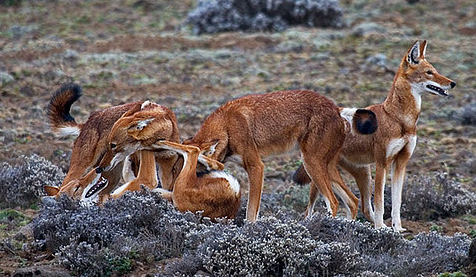 Ethiopian wolves' pack structures are unique in that they are primarily composed of males -- males born into the packs typically do not leave their birth pack, while females disperse at roughly two years of age to seek new homes. The dominant female in the Ethopian wolves' pack structure restricts the other females' breeding, and will mate only with the dominant male; however, she will also mate with males from outside of her own pack. The subordinate females in the pack are expected to help rear the dominant female's children. Ethopian wolves prefer mountainous habitat where their prey species are abundant; as they almost exclusively prey on daytime rodents. Their populations are typically isolated from other canines, though they sometimes interact with various species of Jackal. Ethiopian wolves almost exclusively eat rodents and other small mammals; they do not tend to prey on antelope, livestock, or other ungulate prey. There were very few Ethiopian wolves just prior to humanity's destruction; human interference had caused drastic population drops. Following 1988, there was some population recovery; however, in 1990, a rabies outbreak again reduced the population to a dangerously low number of animals. 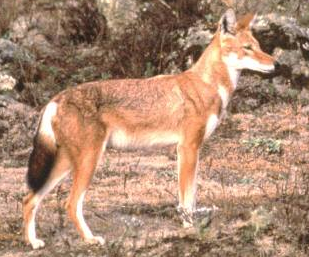 Some even claimed the Ethiopian wolves were no more -- however, a number of years later, various populations began to resurface, and the species again stabilized. 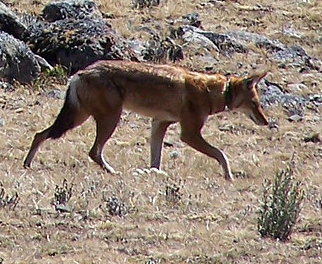 Many Ethiopian wolves are Luperci, having picked up the trait from neighboring Jackal populations. 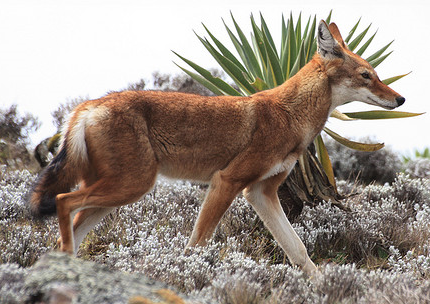 Most Ethiopian wolves prefer to live in their four-legged forms; however, some can be seen in the African cities, having traveled far outside of their home range to cultivate a more human lifestyle. In their home range, they are almost exclusively feral.